How many lies and how many innocent lives have been sent out into the ethers by men like Junior Bush and his Bush/Cheney Cabal? Too many is the answer. Yet, as with the case with the Irish singing star (and humanitarian) Bono, Junior Bush has been ‘Born Again Philanthropist’. Well, good for him, but… that should not and DOES not absolve him from his war crimes. 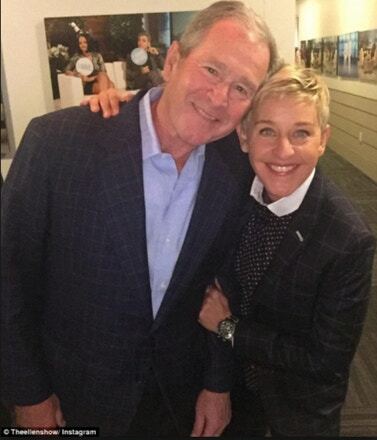 The real shame of all of this is just how short a memory do Ms. Ellen Degeneres and Mr. Bono have? I mean, come on you two Media stars, have you both forgotten what transpired beginning in October of 2001? Does this writer need to once again review the horrific damage we, and our NATO led coalition did to the nations of Iraq and Afghanistan? 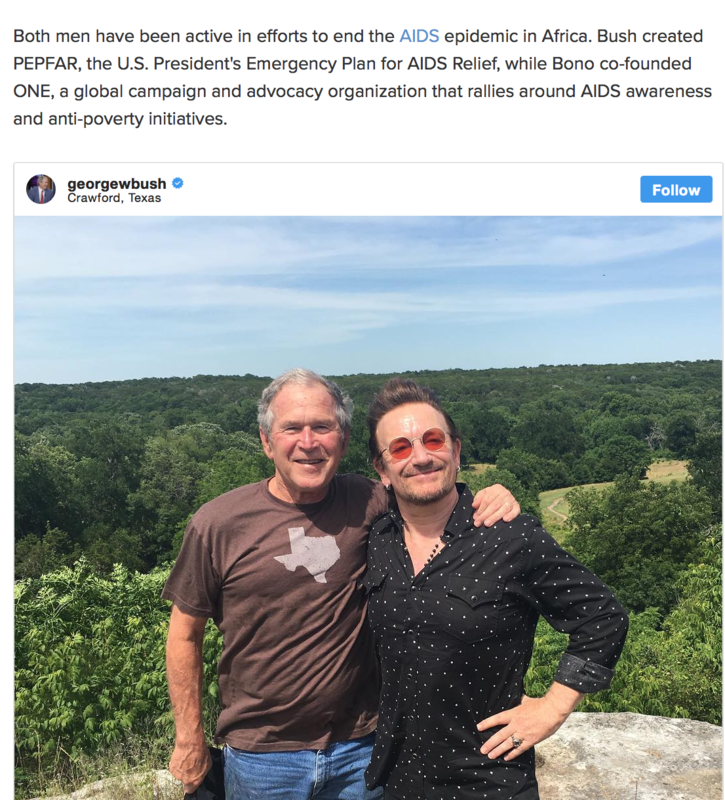 Bono, you the humanitarian, have you seen the photos of the myriad of little children with no limbs or eyes or birth defects from our depleted uranium shells? Ellen, you who call yourself such a ‘liberated feminist’, how many women in those two countries are either dead or widowed or parentless/childless due to those actions signed off by Junior Bush? Let us not forget Mr. Obama, who has his dirty hands in all of this ‘Empire on Steroids’. It was he, influenced stringently by Mrs. Clinton and the other Neo Cons surrounding him, that ‘signed off’ on the illegal and immoral carpet bombing of Libya in 2011. What that accomplished was to open up that nation to the chaos it still is engulfed in. Another Middle Eastern nation that, for all of Gaddafi’s flaws, had the greatest standard of living and a better safety net that we have here. All destroyed for the sake of empire. You see, Gaddafi was going to take Libya OFF of the petrodollar and onto a new African currency. And , he would not participate in our empire’s Africa Command or better known as Africom. For Junior Bush and his Bush/Cheney Cabal, Saddam Hussein, for decades our gangster running Iraq, was conned by Bush Sr. in 1990-91 into our infamous Desert Storm. Years later he decided to begin selling his oil away from the petrodollar and via the Euro, so…. Bye Bye Saddam. The sad joke many of us in the Anti War community share is that if Iraq had Coconut Oil under the ground instead of Crude Oil… no more ‘ Saddam the Hitler’ and no War on Iraq 1 or 2. Ms. Degeneres and Mr. Bono: no doubt you care about all these facts. Do you? Philip A Farruggio is a son and grandson of Brooklyn, NYC longshoremen. He has been a free lance columnist since 2001, with over 300 of his work posted on sites like Consortium News, Information Clearing House, Global Research, Nation of Change, World News Trust, Op Ed News, Dissident Voice, Counterpunch, Activist Post, Sleuth Journal, Truthout and many others. His blog can be read in full on World News Trust., whereupon he writes a great deal on the need to cut military spending drastically and send the savings back to save our cities. Philip has a internet interview show, ‘ It’s the Empire… Stupid’ with producer Chuck Gregory, and can be reached at [email protected].